Catalog > Quinoa, Red Organic 5 lbs. Red Quinoa is very high in protein, calcium and lysine, an excellent source of iron, phosphorus, B Vitamins and Vitamin E. Red Quinoa reduces kapha and can be used in moderation by vata and pitta and when seasoned to meet their needs. 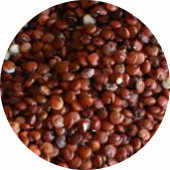 Red Quinoa is a very good choice mixed with Amaranth and Millet when cooked as a breakfast cereal. It can also be sprouted and used in sprouted cereals, cookies or breads. Sprouted, ground into flour or both, quinoa can be used in bread, cereal, cookies, crusts, desserts, energy bars, puddings, soups, sprouted loaves, toppings or eaten alone.